Can you believe it’s almost May! Seriously where does the time go? I feel as if I haven’t really made the best of the year yet. 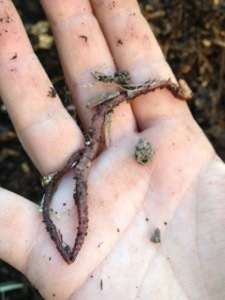 I have been spending the mornings before work weeding, planting and watering. 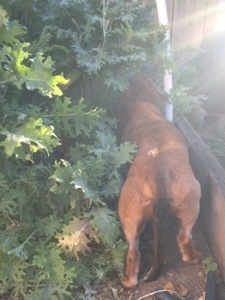 The birds are out and the dachshunds are begging for some overgrown kale. Its peaceful. It helps set the tone of the day. Last week I had a migraine for days. I admit I am a huge baby when it comes to headaches. Chop my finger off I’m ok, but a headache? I just can’t cope. I felt exhausted by Friday.Saturday night we celebrated my moms birthday at one of our favorite restaurants. I ate a spinach salad and later that night I had a huge allergy attack. I just can’t be sure of ever eating out I suppose. Whenever I have an attack, the next day I’m fatigued and my stomach is sore. I drink fluids but I stay away from eating for most of the day. I know it’s not healthy but really it allows my gut to rest. This week I have given up eating out, at all costs. I have focused on eating raw. It’s been somewhat of an easy adjustment. 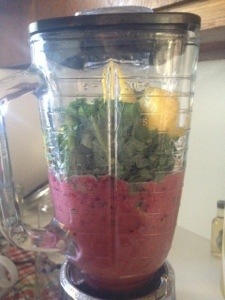 By Tuesday I was making green smoothies with my kale. Amazingly, I have had consistent energy throughout the day too. I do make sure I eat breakfast, lunch, an afternoon snack and a light dinner. I looked at different recipes online however all used juice or yogurt. I used 1/2 cup of water instead. I wanted the smoothie to be light and not too sweet. Experiment with what’s on hand. 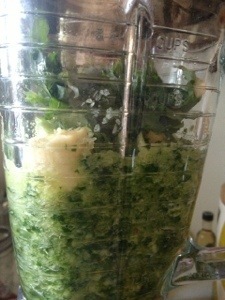 I almost added a jalapeño to the green smoothie but refrained. Maybe for tomorrow’s breakfast…try different combinations and favors. Have fun with it! I put tomatoes and marigolds in the ground this week too. The weather in the Bay Area has been between 72-85 degrees. It’s been lovely really. I used one compost bin worth of freshly grown dirt. 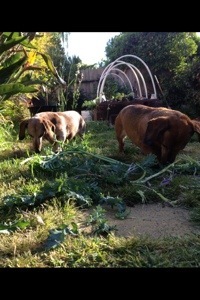 It smells great and full of red wrigglers too! 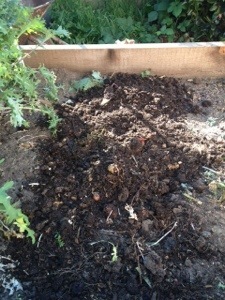 The tomatoes will love the richly nutrient compost I’m sure! These small actions of growing my own food, and eating clean makes me feel good about my life. It’s easy to plant lettuce in pots or even a tomato plant. If everyone grew something they ate, they would feel better mentally, eat healthier and be happier. I’m on my way to a healthier lifestyle and a more happier life too. This entry was posted in Food, Gluten Free, Knitting, Personal dialogue for a happy life and tagged compost, Dachshund, gluten-free, juice, Organic gardening on April 25, 2013 by amybailey aka knitsakes.